Where I grew up, in Edinburgh, only the older stone houses had working shutters, and those were on the inside of the windows. Makes perfect sense, as they could be closed without having to (a) open the window, or (b) go outside! But the practice of building shutters into Scottish houses stopped around the 1890s. Our house there was just too young, but our neighbours’ place, built in the 1880s (the house that is, not the neighbours!) had real shutters which we really envyed on a cold Scottish winter’s night. 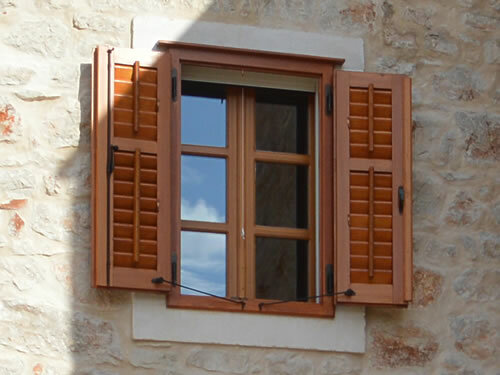 In traditional Dalmatian houses, there are two forms of shutters – grilje which have moveable slats, and škure with solid panels. The examples here are in traditional wood, or these days you can get them in a more practical aluminium or uPVC finish. DIY warehouses stock them in standard window sizes, which is all well and good, but old houses don’t work that way! We therefore have lovely hand-built wooden grilje, which we love the look of, but they need frequent maintenance, as we’re now discovering! 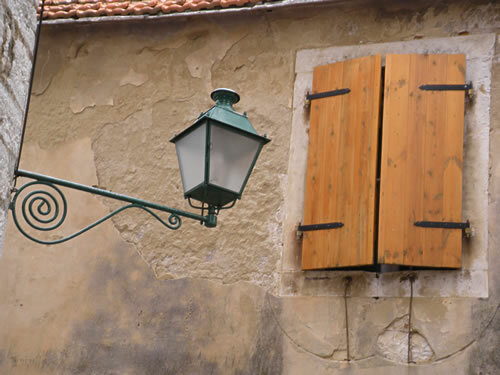 In much of southern Europe, houses are shuttered in the summer to keep out the heat. Of course, with shutters here being on the outside, you can leave the window open to create a bit of a draft. I also really enjoy the ability to close out the world when it gets cold, dark and wet in winter, especially when there’s a bura blowing! It’s all terribly convenient, and so much cheaper than extra heating or air conditioning. I’m still learning about the local traditions in colour choices. Natural wood, browns and greens appear to be acceptable anywhere, while blue is only for town houses, possibly more up-market? 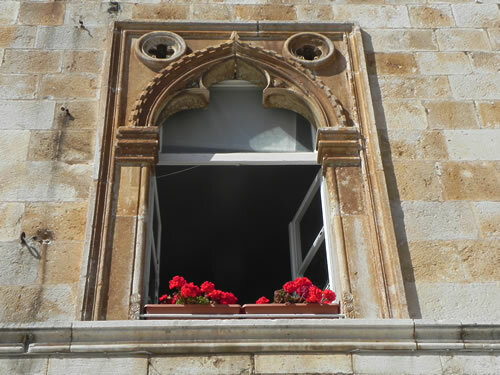 The addition of stone lions next to the window indicates that someone important lives here, no doubt! Some people make a really bold statement with their shutters and wall ornaments. You can tell this is an art gallery, can’t you? It’s been done with style, and I really enjoy the way the muted lavender goes with the stone. Add to that some flowers in the garden, and it’s very pretty. Not sure I’d have the courage to try that myself, though! At the other end of the spectrum, we have the natural weathered look with rusted hinges. The paint on these škure has mostly flaked off, with just a remnant of red-brown to show what it might have been. The grey of the old wood blends well with the surrounding stone for a very pleasing picture. 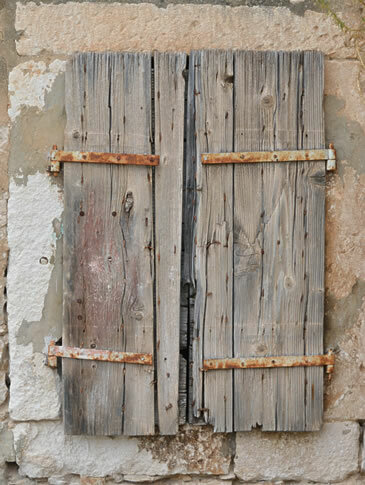 There’s an entire series of these old shutters coming up! And here’s another! This time you can really see the red-brown paint, partly protected by the overhanging roof. 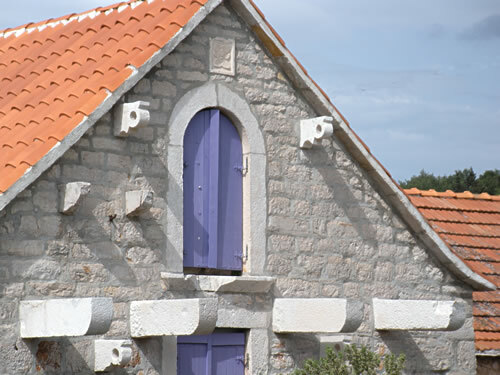 These shutters have been well-made, and look at that lovely window surround, traditionally made from white Brač stone. 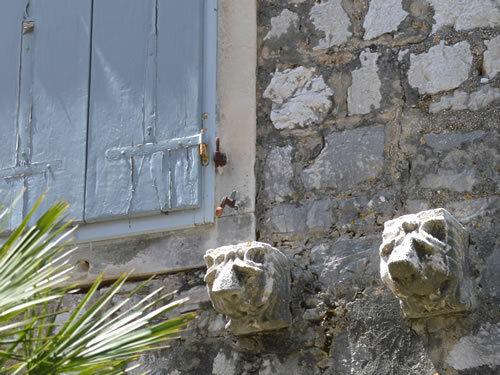 The island of Brač is just to the north of us, and produces a fine-grained, hard limestone that isn’t quite marble, but close to it and very beautiful. Notice also, the neat little catches to hold open the shutters. Very nice! 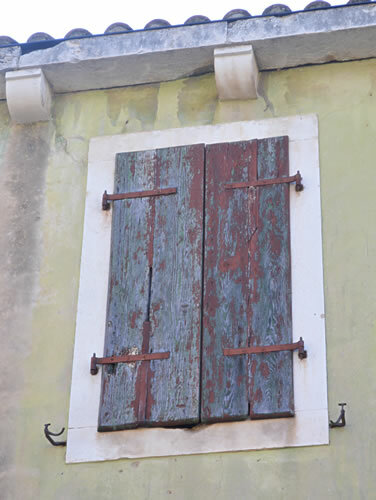 OK, so where are the shutters in this rather posh venetian-style window looking out onto Hvar’s main pijaca? I guess palaces didn’t use shutters, or is it possible they put them on the inside? With an ornate window like that, you could only really shutter the lower part, and I understand that’s how shutters originally developed, back in medieval times. Expensive glass for the top portion, and just the shutters below. But for all I know, these windows have never had shutters. The windowbox is a nice touch – lovely splash of colour!